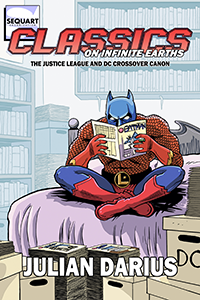 With DC expanding its movie and TV offerings, we thought we’d remind you about our big book on the Justice League and DC’s universe-wide crossovers, written by Julian Darius. In this series, acclaimed comics scholar Dr. Julian Darius argues that the DC Universe is old enough to have produced a canon of classic stories. 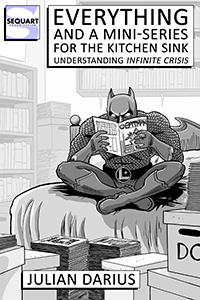 Here, he analyzes this canon as it pertains to the Justice League and DC’s universe-wide crossovers. Since 1940, DC Comics has been bringing its heroes together, first as the Justice Society, then (beginning in 1960) as the Justice League, and finally (beginning in 1985) in universe-wide crossovers. Shared super-hero universes achieved widespread attention in the wake of Marvel’s MCU movies, but DC’s been paving the way since 1940. A decade in the making, Classics on Infinite Earths takes readers on a tour of this history, using discussion of classic stories as a unique way of illuminating the history and evolution of the DC Universe. In the process, Darius offers what may be the very first long-term study of how to manage such a shared universe. The book runs 428 pages. The book is now is available in print and on Kindle. (Just a reminder: you don’t need a Kindle device to read Kindle-formatted books; you can download a free Kindle reader for most computers, phones, and tablets.) Find out more on the book’s official page or its Facebook page. Tagged Classics on Infinite Earths, crossovers, Julian Darius, Justice League, Justice Society, Sequart's Spotlight Series. Bookmark the permalink. 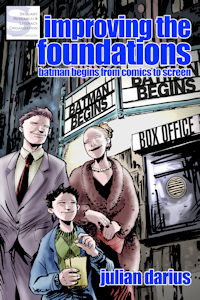 Mike produces books and documentaries about comics. He's now trying to write his own comics. He tells everyone else at Sequart what to do. Do they listen? Eh. See more, including free online content, on Mike Phillips's author page. 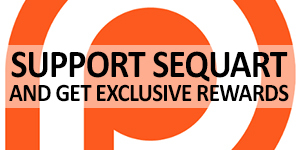 Two Free Sequart Books Available on Kickstarter!